Legal tabloid Above the Law recently published an email from a Biglaw partner to all associates, admonishing them to check their email every hour unless "asleep, in court or in a tunnel." The partner goes on to declare that "all of our clients expect you to be checking your emails often." The back story is that a partner emailed a new associate a request to send a fax to "a relatively new client whom we were trying to impress" but the associate had left for the day and didn't attend to the task until returning in the morning. The partner closes the lesson by reporting that "in this case it was no harm no foul, but I think we can all imagine scenarios when this could be a disaster." 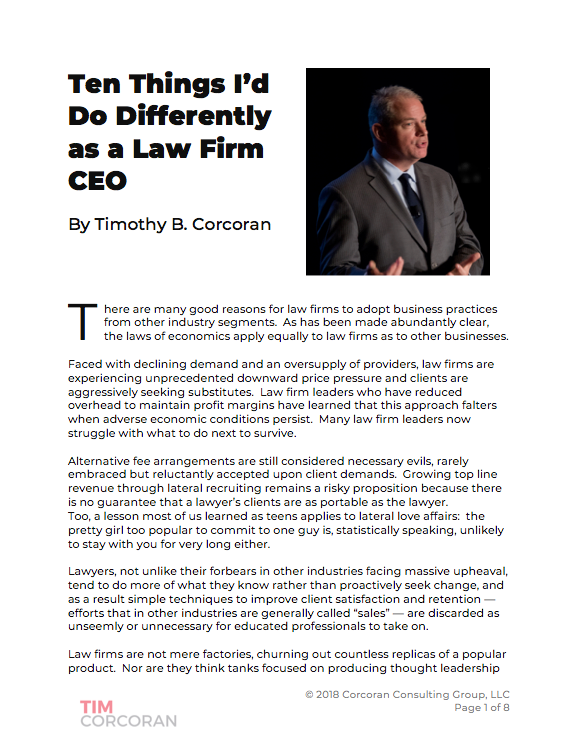 As the Association of Corporate Counsel annual conference winds down, and our RSS readers are deluged with reports of how in-house counsel demands are increasing, placing unprecedented pressure on outside counsel, it might be helpful to once again reiterate a fundamental truth in client service: speed does not equal responsiveness. Now I don't know the back story behind the back story. Perhaps the client was in his office expecting a late night draft, but the "no harm no foul" comment suggests otherwise. So let me superimpose my own experience and propose a likely fact pattern: the partner believes that impressing a client requires speedy turnaround of work product, so he requested a late-night fax to the client's office which would greet him or her upon arrival in the morning, demonstrating the firm's round-the-clock responsiveness to his needs. Trouble is, relying on a fax to send this message is a bit like sending the finest horseman to inform the townspeople of the latest Amber Alert. Why not send an email if speed is your central concern? But of more interest to me is the partner's assumption that speed is impressive. Clients regularly complain about a law firm's lack of communication and responsiveness. Translating this as a desire for speed is not uncommon. However, what it often calls for is setting proper expectations, and then meeting (or exceeding) the expectations. Given our presumed fact pattern above, if the client was advised that a draft memo would be on his or her desk at 9 AM the following morning, and it was, then the expectation was met. Exceeding this expectation is admirable, but if the client wasn't in the office late at night to receive the fax then the impact of the speedy response is wasted. Impressing a client is all about understanding his needs, setting proper expectations for what it takes -- how long, how much, how difficult -- to address these needs, then fulfilling the expectations you've established. Obviously things change, and often in thorny deals and litigation time is of the essence. So when lightning-fast speed is a need, build it into the expectations. But be careful about demonstrating round-the-clock prowess to a client who is price-sensitive, because the first thought that will leap to mind may be, "We agreed on tomorrow morning. I'm pleased that you sent a fax to my (empty) office 12 hours early, but I hope that any extra effort taken to beat the agreed-upon deadline won't be reflected on my invoice." Clients can be confusing that way. This is why we ask questions, set proper expectations and then use these as guidelines for delivering exceptional service. Substituting our own definition of exceptional service is a short-cut that we sometimes can make only once in today's competitive market. Is Pro Bono At Risk?